© Al-Asmari et al. ; Licensee Bentham Open. Venoms of two cobras, four vipers, a standard antibiotic and an antimycotic, were evaluated comparatively, as antimicrobials. Six venom concentrations and three of the standard antibiotic and the antimycotic were run in micro-dilution and diffusion plates against the microorganisms. Echis pyramidum, Echis coloratus and Cerastes cerastes gasperettii highest venom concentrations gave significant growth inhibition zones (GIZ) with respect to a negative control, except Bitis arietans, whose concentrations were significant. The cobra Walterinnesia aegyptia had significant venom concentrations more than Naja haje arabica. The Staphylococcus aureus Methicillin Resistant (MRSA) bacterium was the most susceptible, with a highly (P < 0.001) significant GIZ mean difference followed by the Gram positive Staphylococcus aureus, (P < 0.001), Escherichia coli (P < 0.001), Enterococcus faecalis (P < 0.001) and Pseudomonas aeruginosa which, had the least significance (P < 0.05). The fungus Candida albicans was resistant to both viper and cobra venoms (P > 0.05). The antibiotic Vancomycin was more effective than snake venoms though, they were more efficient in inhibiting growth of the resistant Pseudomonas aeruginosa. This antibiotic was also inactive against the fungus, whilst its specific antifungal Fungizone was highly efficient with no antibacterial activity. These findings showed that snake venoms had antibacterial activity comparable to antibiotics, with a directly proportional relationship of venom concentration and GIZ, though, they were more efficient in combatting resistant types of bacteria. Both venoms and the standard antibiotic, showed no antifungal benefits. Keywords: Agar diffusion, antimicrobial, Echis pyramidum, fungizone, GIZ, venoms..
Bacterial infections involving the multidrug resistant strains are among the top leading causes of death throughout the world. Healthcare system across the globe has been suffering from an extra-ordinary burden in terms of looking for the new and more potent antimicrobial compounds . The majority of bacteria such as Pseudomonas, Klebsiella, Enterobacter, Acinetobacter, Salmonella, Staphylococcus, Methicillin Resistant S. aureus (MRSA), Enterococcus and penicillin-resistant Streptococcus pneumoniae (PRSP) vancomycin-resistant enterococci have developed several ways to resist antibiotics. Such bacteria are becoming a serious clinical problem throughout the world [2-6]. Natural products are important sources of medicinal compounds. A wide variety of organisms produce such bioactive compounds and some of these natural substances have been shown to be able to kill bacteria [6-10]. Snake venoms contain a great variety of biologically active proteins responsible for various pathological effects. Venoms include toxins which are highly potent compounds with selective and specific activities. They can be useful and valuable as pharmacological tools in drug research, as potential drug design templates and as therapeutic agents [11, 12]. In recent years, venoms and venom components from different venomous animals have shown potential antibacterial activity. This includes snake [13-15] and scorpion venoms [16-19]. To date, only a few studies have been made on the antimicrobial activities of snake venoms . In 1948, Glaser investigated antibacterial activity of Crotalus venom  and then in 1968 Aloof Hirsch and his colleagues reported an antibacterial lytic factor from the venom of the cobra Hemachatus haemachatus . Now it is fully documented that the snake venoms have a number of cytotoxic factors along with potent killing effect on bacteria as well as viruses [22-25]. Rideiro et al.,  reported the presence of L-amino acid oxidase present in snake venom and displayed many important biological properties that included the bactericidal and virucidal activities. A new antibiotic vejovine has been discovered from the Vaejovis mexicanus scorpion venom and this agent has been proved to be highly effective on pathogenic bacteria . Captopril, anti-hypertensive drug was designed based on the peptide inhibitor of angiotensin-converting enzyme from the venom of Bothrops jararaca snakes . Echistatin and Ecarin are two bioactive molecules, isolated from Echis carinatus snake venom. Echistatin is one of the most potent disintegrin polypeptide which has platelet aggregation inhibitor activity and used as an anticoagulant while Ecarin is an enzyme used in the ecarin clotting time (ECT) test to monitor anticoagulation during treatment with hirudin [27-30]. In a recent study it was demonstrated that the venom from one of the world's most venomous snakes Mamba could be the key to a new breed of painkillers, may be more potent then morphine . Several naturally occurring peptides have shown their promise towards the antimicrobial activity however the family Viperidae snake venoms have not been explored thoroughly, although they are a major source of so many active peptides [13, 32]. The antimicrobial peptides are electrically attracted to the negative charged groups of the cell surface, where they develop an α- helical conformation and these charged groups get accumulated on the membrane. This can result in the formation of transient pores, membrane perturbation and ultimately the cell lysis . In this study we employed 4 crude venoms of the snakes of Viperidae and 2 crude venoms of Elapidae family for their effects on the growth of pathogenic microorganisms. Similar screening focusing on antimicrobial property has not been attempted previously among indigenous Saudi Arabian snakes. Snake venoms of two snake groups that belong to two families (Viperidae and Elapidae) were obtained from the Research Center, Prince Sultan Military Medical City (PSMMC), Riyadh, Saudi Arabia. The initial stocks of venoms were prepared in normal saline at a concentration of 10mg/mL and purified by passing through 0.22µm membrane filter. Further dilutions were made in sterile saline and used in this study. Freeze dried microbial cultures of S. aureus (S. aureus) ATCC 25923, E. faecalis (E. faecalis) ATCC 29212, E. coli (E. coli) ATCC 25922, P. aeruginosa (P. aeruginosa) ATCC 27853 and Candida albicans (C. albicans) ATCC 66027 were purchased from Microbiologics, Inc. (St. Cloud, MN. USA). The laboratory strain of methicillin resistant S. aureus (MRSA) 12498 was obtained from the Department of Microbiology in PSMMC. Brain Heart Infusion broth (BHIB), Sabouraud Dextrose broth (SDB), Brain Heart Infusion agar (BHIA), Sabouraud Dextrose agar (SDA) were purchased from local company agents in Riyadh, Saudi Arabia. The antifungal (Fungizone) was originally bought from Gibco Life Technology, U.K. and the antibiotic (Vancomycin) was from Sigma, USA and were used accordingly. The initial stocks of venoms were prepared in normal saline at a concentration of 10mg/mL and sterilized by 0.22µm membrane filter and stored in -20º C until use. All of the bacterial cultures with the exception of C. albicans were grown in BHIB and the stocks prepared in 50% glycerol were stored at -40º C. C. albicans culture was grown in SDB and stored at -40º C as glycerol stock culture. The enumeration of C. albicans colonies and the growth inhibition were determined on SDA-plates prepared in the laboratory. Microbial inoculum that would be used for antibacterial screening assays was prepared using the standard method of log-phase growth and were standardized to 0.5 McFarland unit and log dilutions were made in phosphate buffer saline (PBS) for each microorganism. Antimicrobial susceptibility tests were performed by the agar-diffusion method, which was based on Ouchterlony technique and slightly modified according to Barry and Brown . Sterilized BHIA was melted in a microwave oven and then placed in a water bath set at 45ºC. Once the temperature was stable, bottles containing agar were removed and 0.1mL of overnight grown bacterial cultures were added. Two to three Petri plates were poured for each microbe and once the agar was solidified, plates were transferred to the refrigeration temperature for 2-3 hours. A dedicated agar punch was used to cut holes in agar and 0.05 mL of various dilutions of venom (0.25, 0.5, 1, 2.5, 5, 10 mg/mL) was added to each well. Normal saline, used as a diluent was employed as a negative control. After leaving plates on the bench for an hour, they were transferred to the incubator. The zones of microbial growth inhibition were recorded after 48h of incubation. 24h microbial colony cultures were standardized to 0.5 McFarland unit and log dilutions were made in phosphate buffer saline (PBS) for each microorganism. Several dilutions of the crude venom (0.0625, 0.125, 0.25, 0.5, 1, 2.5, 5, 10 mg/mL) in triplicate were mixed with the microbial inoculum and incubated at 37ºC incubator. The PBS was used as negative control. At 24h of incubation, aliquots of samples were removed and log dilutions were prepared in sterile PBS. Petri plates containing BHIA were inoculated with 100µL of inoculum in triplicate and this inoculum was spread using a sterile glass rod bent at 90ºC and a plate rotator (Sensoturn). The Petri plates were incubated for 48h and the CFU were counted either with naked eye or using a colony counter. Means and standard deviations of the zone inhibition data were collected and calculated using Microsoft Excel. Statistical significance was determined by t-test and one-way ANOVA, employing GraphPad Prism, GraphPad Instat and SPSS packages. Mean zones of microbial growth inhibition (in mm), which were caused by the six most effective venom concentrations of six snakes. were found to be the most relevant ranges of the six snake venoms, applicable for statistical analyses. The paired T-test was employed to verify the significance of venom concentration effect of all snake species with respect to control (saline). For the first viper snake E. pyramidum, the venom concentration range (0.25mg - 10mg) gave 4.00 mm - 10.00 mm mean growth inhibition zones (GIZ) for all five microbial species (Table 2). Paired T-test analysis of viper snake venoms concentration mean microbial zone of growth inhibition against control (Normal Saline). Only concentration 2.5mg, 5.0mg and 10mg gave significant (P≤ 0.011, P≤ 0.008 and P≤ 0.008, respectively) GIZ with respect to controls (Table 2). For the second viper snake E. coloratus, the venom concentration range (0.25mg - 10mg) gave 3.17 mm - 10.83 mm mean GIZ for all five microbial species. The concentration 0.5mg, 1mg, 2.5mg, 5.0mg and 10mg gave significant (P≤ 0.038, P≤ 0.036, P≤ 0.009, P≤ 0.008 and P≤ 0.007, respectively) GIZ with respect to controls (Table 2). For the third viper snake C. gasperettii, the venom concentration range (0.25mg - 10mg) gave 3.50 mm - 8.33 mm mean GIZ for all five microbial species. The concentration 5.0mg and 10mg gave significant (P≤ 0.039 and P≤ 0.011, respectively) GIZ with respect to controls (Table 2). For the fourth viper snake Bitis arietans, the only concentration range of its venom (1mg - 10mg) gave 2.17 mm - 3.00 mm mean GIZ for all five microbial species. All these concentrations (1mg 2.5mg, 5.0mg and 10mg) gave insignificant (P≤ 0.176, P≤ 0.176, P≤ 0.179 and P≤ 0.178, respectively) GIZ with respect to controls (Table 2). With respect to the effect of elapid snake venom concentrations, the first one N. arabica venom concentration range (0.25mg - 10mg) gave 1.00 mm - 9.00 mm mean GIZ for all five microbial species. Out of six, only the concentrations 1mg, 2.5mg, 5.0mg and 10mg gave significant (P≤ 0.032, P≤ 0.007, P≤ 0.006 and P≤ 0.007, respectively) GIZ with respect to controls (Table 3). Paired T-test analysis of elapid snake venoms concentration mean microbial zone of growth inhibition against control (Normal Saline). The second elapid snake W. aegyptia venom concentration range (0.25mg - 10mg) gave 3.33 mm - 11.17 mm mean GIZ for all five microbial species. All six venom concentrations, except the first (0.25mg) gave significant (P≤ 0.012, P≤ 0.011, P≤ 0.009, P≤ 0.010 and P≤ 0.010, respectively) GIZ with respect to controls (Table 3). It was observed that GIZ had a directly proportional relationship with venom concentration for all experimental venom groups. The Tukey's Multiple Comparison Test was employed to determine the susceptibility of each microorganism compared to control (Normal saline) based on the GIZ (Table 4). S. aureus (MRSA) bacterium was the one with the largest (12.38 mm) Mean Difference and the highest (20.45) q level and a highly (P < 0.001) significant probability value. Next susceptible bacterium was S. aureus with 8.958 mm Mean Difference, q level of 14.80 and a highly (P < 0.001) significant probability value. Next were E. coli and E. faecalis bacterial species, withthe same highly (P < 0.001) significant probability values. The least susceptible bacterium was P. aeruginosa with 2.986 mm Mean Difference, q level of 4.933 and a significant (P < 0.05) probability value. Tukey's Multiple Comparison Test of microbial growth inhibition level caused by various snake venom concentrations and a control (Normal saline). Fig. (1) shows the comparative differences between effects of the elapid and viperid snake venoms, one antibiotic (Vancomycin), one antimycotic (Fungizone) and a negative control (normal saline) on growth of five pathogenic bacterial species and a fungus shown GIZ (in mm). The standard antibiotic (Vancomycin) was the most effective antibacterial agent in inhibiting the growth of four bacterial species (S. aureus (MRSA), E. faecalis, S. aureus and E. coli), in that order. All venoms were next to it in activity, though they were more efficient in inhibiting the growth of P. aeruginosa except the venom of the viper C. gasperettii. Both Vancomycin and venoms were unable to inhibit the fungal Candida albicans growth whilst its specific antifungal Fungizone (Amphotericin B) highly efficient with no antibacterial activity. Comparative differences between effects of snake venoms, antibiotics, antimycotics and normal saline (control). Inhibition of microbial growing of six pathogenic bacterial species and a fungus shown as mean growth inhibition zone (in mm). Venoms, especially those of snakes are a mixture of proteins and peptides including the nucleotides, free lipids and carbohydrates, which are bound to proteins . They have consistently shown high levels of heterogeneity and intra and interspecies variation and this could be due to local adaptation for feeding on different prey . The venoms obtained from the Viperidae family had long been recognized for their complexity of molecular composition . Several studies had described the antimicrobial effect of snake venoms, which enlightened the emergence of bio-active peptides as therapeutic alternatives to combat the antibiotic resistant microorganisms . Six venom concentrations were chosen out of eight that showed the least concentrations that represented the MIC but, this choice was applied according to the analysis of the GIZ. Paired T-test analysis of the selected concentration ranges of the six snake venoms has clearly shown significant GIZ, with varying degrees. With respect to venoms of the vipers, E. coloratus was the most effective against the five microorganisms, reflecting the largest mean of GIZ and a significance of five rising venom concentrations. Venoms of E. pyramidum and C. gasperettii have got medium effects, presenting only three and two significant venom concentrations, respectively. The puff adder Bitis arietans venomhas got the least effect and none of the six venom concentrations showed any significant GIZ. Previous studies have reported comparable RESULTS [5, 38]. On the other hand, venoms of the cobras showed to be very effective against the five microorganisms, with comparable significance to viper venoms and though the cobra W. aegyptia showed five significant rising venom concentrations, similar to that of E. coloratus (the first most effective viper venom) but, it exceeded it (the cobra exceeded the viper) in GIZ value. The second was the cobra N. arabica and though it had got a slightly less GIZ value than the second viper (E. pyramidum, with three significant venom concentrations), but, it got more significant venom concentrations (four) which, showed that this cobra venom was more effective than the second viper. One more venom concentration in the serial range presented a more dilute concentration that implies a more effective venom type, according to the MIC criteria and the directly proportional relationship between venom concentration and GIZ. This put the second cobra as a the third in effectiveness of the whole list of venoms. The group of cobra venoms appeared to be relatively more efficient as antimicrobial agents than viper venoms. Some previous studies  reported contradictory conclusions to our RESULTS though, some cobra venoms (Ophiophagus hannah) were also more active than those of the vipers. It was suggested that snake venom antimicrobial activity was due to enzymes such as PLA2 [9, 40, 41], which is also available in the venoms of cobras. With respect to microorganism susceptibility, The Gram positive cocci S. aureus (MRSA) bacterium appeared to be the most sensitive to venoms, as having the largest mean difference and a highly significant probability value. Close to it was the second Gram positive cocci S. aureus in sensitivity to venoms, with the same highly significant probability value. Venom sensitivity of these Gram positive bacteria and other species has been reported before . The Gram negative E. coli and the positive E. faecalis bacterial species, have also gotthe same highly significant probability but, their mean difference GIZ values were less, thus showing some relative resistance to venom action. The least susceptible bacterium was also the Gram negative P. aeruginosa which, had got a minimum of mean difference with a relatively significant value. Resistance of the Gram negative bacteria had been attributed to the outer membrane of the bacteria formed of lipopolysaccharides (LPS) which affected the uptake of antimicrobial peptides . 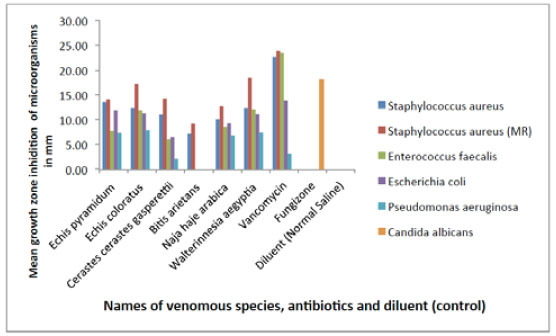 Levels of elapid and viperid snake venoms presented a fair pattern of effectiveness in comparative differences with the two standard treatment agents, the antibiotic (Vancomycin), and the antimycotic (Fungizone), employing GIZ parameters of selected three concentrations. Vancomycin as a specifically effective antibacterial agent, was the best in inhibiting the growth of S. aureus (MRSA), E. faecalis, S. aureus and E. coli, in that order, whilst all the venoms closely came next, with varying levels. Venoms showed to be more efficient than Vancomycin in inhibiting the growth of the more resistant P. aeruginosa,excepting the venom of C. gasperettii. Several works concerning comparisons of venoms and venom fraction with antibiotics had been reported [14, 40]. With respect to the fungus Candida albicans, RESULTS were negative, hence they were removed from the analysis tables. It was concluded here that snake venoms have comparable activity, if not more efficient than antibiotics, whilst cobra venoms appear to be relatively more efficient as antimicrobial agents than viper venoms. Until furthermore studies, the selected six snake venoms, within the employed ranges of concentrations, cannot be a suitable solution in treatment of fungi like Candida albicans. The study was supported by Prince Sultan Military Medical City, Riyadh, Saudi Arabia. The authors wish to thank to Mr. Syed Ali for his help in this study. Nafeesa A, Sheikh MA. Microbial resistance of Staphylococcus aureus against commonly used antibiotics. J Med Sci 2001; 1: 97-100. Ang JY, Ezike E, Asmar BI. Antibacterial resistance. Antibacterial resistance. Symposium series Society for applied microbiology. Ser Soc Appl Microbiol 2004; 3: 229-39. Dadgar T, Asmar M, Saifi A, et al. Antibacterial activity of certain iranian medicinal plants against methicillin-resistant and sensitive. Asian J Plant Sci 2006; 5: 861-6. Zakaria ZA, Jais AM, Mastura M, et al. In vitro anti staphylococcal activity of the extract of several neglected plants in Malaysia. Int J Phamacol 2007; 3: 428-31. Al-Ahmadi AJ, Fathi B, Jamshidi A, et al. Investigation of the antibacterial effect of venom of the Iranian snake Echis carinatus. Ind J Veter Sci Technol 2010; 2: 93-100. Salama W, Geasa N. Investigation of the antimicrobial and hemolytic activity of venom of some Egyptian scorpion. J Microbiol Antimicrob 2014; 6(1): 21-8. Wenhua R, Shuangquan Z, Daxiang S, Kaiya Z, Guang Y. Induction, purification and characterization of an antibacterial peptide scolopendrin I from the venom of centipede Scolopendra subspinipes mutilans. Indian J Biochem Biophys 2006; 43(2): 88-93. Jenssen H, Hamill P, Hancock RE. Peptide antimicrobial agents. Clin Microbiol Rev 2006; 19(3): 491-511. Permual SR, Pachiappan A, Gopalakrishnakone P, et al. In vitro antibacterial activity of natural toxins and animal venoms tested against Burkholderia pseudomallei. BMC Infect Dis 2006; 6(100): 1-16. Shittu LA, Bankole MA, Ahmed T, et al. Antibacterial and antifungal activities of essential oils of crude extracts of Sesame Radiatum against some common pathogenic micro-organism. Iran J Pharmacol Ther 2007; 6: 165-70. [IJPT]. Harvey AL, Robertson B. Dendrotoxins: structure-activity relationships and effects on potassium ion channels. Curr Med Chem 2004; 11(23): 3065-72. Koh DC, Armugam A, Jeyaseelan K. Snake venom components and their applications in biomedicine. Cell Mol Life Sci 2006; 63(24): 3030-41. Stiles BG, Sexton FW, Weinstein SA. Antibacterial effects of different snake venoms: purification and characterization of antibacterial proteins from Pseudechis australis (Australian king brown or mulga snake) venom. Toxicon 1991; 29(9): 1129-41. Perumal Samy R, Gopalakrishnakone P, Thwin MM, et al. Antibacterial activity of snake, scorpion and bee venoms: a comparison with purified venom phospholipase A2 enzymes. J Appl Microbiol 2007; 102(3): 650-9. Rideiro PH, Callejion DR, Baruffi MD, et al. L- aminoacid oxidase isolated from Bothrops moojeni snake venom present selective cytotoxic activity against tumor. J Venom Anim Toxins Incl Trop Dis 2007; 13(1): 310. Haeberli S, Kuhn-Nentwing L, Schaller J, et al. Characterization of antibacterial activity of peptides isolated from the venom of the spider Cupiennius Salei. Toxicon 2000; 38: 373-80. Conde R, Zamudio FZ, Rodríguez MH, Possani LD. Scorpine, an anti-malaria and anti-bacterial agent purified from scorpion venom. FEBS Lett 2000; 471(2-3): 165-8. Torres-Larios A, Gurrola GB, Zamudio FZ, Possani LD. Hadrurin, a new antimicrobial peptide from the venom of the scorpion Hadrurus aztecus. Eur J Biochem 2000; 267(16): 5023-31. Hernández-Aponte CA, Silva-Sanchez J, Quintero-Hernández V, et al. Vejovine, a new antibiotic from the scorpion venom of Vaejovis mexicanus. Toxicon 2011; 57(1): 84-92. Glasser HR. Bactericidal activity of Crotalus venom in vitro. Copeia 1948; 4: 245-7. Aloof-Hirsch S, de Vries A, Berger A. The direct lytic factor of cobra venom: purification and chemical characterization. Biochim Biophys Acta 1968; 154(1): 53-60. Chaim-Matyas A, Borkow G, Ovadia M. Isolation and characterization of a cytotoxin P4 from the venom of Naja nigricollis nigricollis preferentially active on tumor cells. Biochem Int 1991; 24(3): 415-21. Borkow G, Ovadia M. Echinhibin-1--an inhibitor of Sendai virus isolated from the venom of the snake Echis coloratus. Antiviral Res 1994; 23(2): 161-76. Möllmann U, Gutsche W, Maltz L, Ovadia M. Activity of cytotoxin P4 from the venom of the cobra snake Naja nigricollis on gram-positive bacteria and eukaryotic cell lines. Arzneimittelforschung 1997; 47(5): 671-3. Borkow G, Marco D, Ovadia M. Isolation and partial characterization of an antiviral proteolytic fraction from the venom of Echis Carinatus Sochureki. Open Biol J 2008; 1: 21-6. Ferreira SH, Bartelt DC, Greene LJ. Isolation of bradykinin-potentiating peptides from Bothrops jararaca venom. Biochemistry 1970; 9(13): 2583-93. Garsky VM, Lumma PK, Freidinger RM, et al. Chemical synthesis of echistatin, a potent inhibitor of platelet aggregation from Echis carinatus: synthesis and biological activity of selected analogs. Proc Natl Acad Sci USA 1989; 86(11): 4022-6. Tans G, Rosing J. Snake venom activators of factor X: an overview. Haemostasis 2001; 31(3-6): 225-33. Guerranti R, Aguiyi JC, Neri S, et al. Proteins from Mucunapruriens and enzymes from Echiscarinatus venom: characterization and cross-reactions. J Biol Haemostasis 2002; 31: 225. Nowak G. The Ecarin clotting time, a universal methos to quantify direct thrombin inhibitors. Pathophysiol Haemost Thromb 2004; 4: 173-83. National Geographic, Daily News. Could Black Mamba Snake Venom Replace Morphine?October [http://news. nationalgeographic.com/news/2012/10/121003morphine-painkillers-blackmamba-snakes-health-science/]. 2012.
 de Lima DC, Alvarez Abreu P, de Freitas CC, et al. Snake venom; any clue for antibiotics and CAM? Evid Based Complement Alternat Med 2005; 2(1): 39-47. Giangaspero A, Sandri L, Tossi A. Amphipathic α helical antimicrobial peptides. Eur J Biochem 2001; 268(21): 5589-600. Barry AL, Brown SD. Fluconazole disk diffusion procedure for determining susceptibility of Candida species. J Clin Microbiol 1996; 34(9): 2154-7. Heise PJ, Maxson LR, Dowling HG, Hedges SB. Higher-level snake phylogeny inferred from mitochondrial DNA sequences of 12S rRNA and 16S rRNA genes. Mol Biol Evol 1995; 12(2): 259-65. Tashima AK, Sanz L, Camargo AC, Serrano SM, Calvete JJ. Snake venomics of the Brazilian pitvipers Bothrops cotiara and Bothrops fonsecai. Identification of taxonomy markers. J Proteomics 2008; 71(4): 473-85. Hancock RE, Chapple DS. Peptide antibiotics. Antimicrob Agents Chemother 1999; 43(6): 1317-23. Bustillo S, Leiva AC, Merino L, et al. Antimicrobial activity of Bothrop alternatus venom from the Northeast of Argentina. Microbiologica 2008; 50: 79-82. Kocholaty WF, Ledford EB, Daly JG, Billings TA. Toxicity and some enzymatic properties and activities in the venoms of Crotalidae, Elapidae and Viperidae. Toxicon 1971; 9(2): 131-8. Perumal Samy R, Gopalakrishnakone P, Ho B, Chow VT. Purification, characterization and bactericidal activities of basic phospholipase A2 from the venom of Agkistrodon halys (Chinese pallas). Biochimie 2008; 90(9): 1372-88. Wang Y, Hong J, Liu X, et al. Snake cathelicidin from Bungarus fasciatus is a potent peptide antibiotics. PLoS One 2008; 3(9): e3217. Nair DG, Fry BG, Alewood P, Kumar PP, Kini RM. Antimicrobial activity of omwaprin, a new member of the waprin family of snake venom proteins. Biochem J 2007; 402(1): 93-104. Devine DA, Hancock RE. Cationic peptides: distribution and mechanisms of resistance. Curr Pharm Des 2002; 8(9): 703-14.